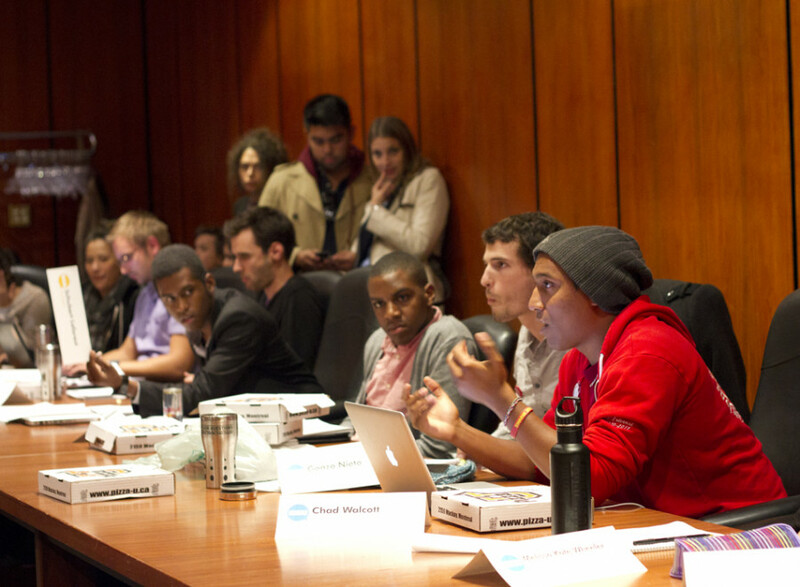 To those who don’t sit on council, hold an executive title or know some of those people intimately, the first regular Concordia Student Union Council meeting of the academic year raised a lot of questions. But one question in particular–why former president Lex Gill was asked to play musical chairs on the Board of Governors—was a question The Link could not find a straight answer to. When current CSU President Schubert Laforest admitted that he could not sit on the Board for academic reasons, he wouldn’t specify what those reasons were in open session. “I’m extremely disappointed with what is happening here tonight,” said councillor and former VP External Chad Walcott during the motion in favour of Lauzon’s selection, adding that he was “not confident” in Lauzon’s ability to manage the ambitious appointment. Walcott, along with several other councillors, such as former executives Gonzo Nieto and Laura Glover, voiced concern that Lauzon lacked proper training—as well as enough time in his schedule to sit on the BoG. “It’s not realistic,” said Walcott. In response to its failure, Nieto motioned that Gill, who already sits as the alternate governor, become the main student representative on the board. As alternate governor, she has the same powers on the Board so long as the regular position remains unfilled. Despite Laforest’s evident uncertainty, every councillor who spoke to the question responded with various forms of the same sentiment: Yes. After a furious debate, which saw Gill herself respond to allegations that she was “not accountable to students,” council moved to appoint her. Following her suggestion, they passed it under the impression that Laforest will use a presidential decree to instate himself once his eligibility has been granted. In that event, Gill will most likely stay on the BoG as the alternate governor. Laforest refused to comment regarding the specific nature of his “academic problems” saying only that the issue is “very personal” and not something he feels comfortable sharing publicly. Article 12 of the university’s bylaws only outlines three specific reasons an elected student would not be eligible to sit on the board. The student must be in good academic standing, currently receiving credit and have a clear academic record. At Wednesday’s council meeting, it was confirmed that Laforest is both in good academic standing and receiving credit, however The Link has been unable to confirm that his record is clear. The clear record requirement implies that the candidate would not be eligible to sit on BoG if charged and found guilty under Concordia’s Code of Rights and Responsibilities or the Academic Code of Conduct in the last three years. However, Laforest refused to elaborate on his situation. Lauzon said he respected the opinion that time management was a concern, but didn’t appreciate some of the insinuations. But Walcott argued it wasn’t about that, and it wasn’t personal. It just wasn’t possible, he said. Laforest wasn’t the only one confused by Gill’s change in status. The difference is slight, at this time reflected in title alone. Without another undergraduate governor, there is no separation of power. But when The Link asked several different people from varying vantage points, several different answers were given. Walcott suggested it was a plan for the worst-case scenario. Should Laforest be unable to resolve his issues, or should he leave his post before he can do so, students will already have a regular governor. Gill, admitting she was unsure, guessed that it might have been an oversight on the part of council. She speculated that council meant to appoint another governor to fill the role of alternate, but forgot to do so in the chaos of the seven-hour meeting. Gill also added that council might have wanted to give her more legitimacy on the Board. She said the change in title would mean a difference in dynamic. Unlike the vote of the motion itself, there was no clear consensus as to why it was passed.